Can you please send me and example of Oracle Reports formula to display barcode data "(02)88429259195141(37)88"? I need to generate GS1 128 barcode and I don't know if I need to select barcode font in Paper Layout, include parentheses in data to encode, select ApplyTilde, etc. NOTE: The solutions will only work in Oracle 9i and up. The Java Component can generate GS1-128 barcodes as an image in Oracle Reports. The Universal Font Package with PLL is also another option. Ben The Universal Font Package includes PostScript Fonts as well as many other font file types. and include .afm, .pfa, and .pfm files. 2. Double-click the PostScript folder. 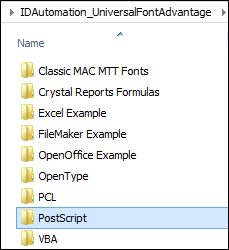 danigome	 I need "font_name.pfm" and "font_name.pfb" to embed fonts in pdf generated by Oracle Reports, as you can see in the link you send me. Where can I get this files? As mentioned in my previous message, the actual font is not responsible for the embedding process and all the PLL does is encode the data (it is not related to the display of the barcode other than the encoding). Verify that when you are embedding as a PDF that you are pointing to the right font. I know that many users have this issue whether they are using barcode fonts or custom fonts. Sometimes the actual font is not selected to be embedded. Beyond this information, there is not much additional support that I can provide. danigome	 I've been using older IDAutomation font in Oracle Reports pdf for several years without any problem. I have only changed the older pll for the newer one (and changed the function call method). Please, tell me what I have to change to get the barcode in the Oracle pdf report, instead of the characters. Neither the font nor the encoder is responsible for this portion. If you are printing directly to the printer (non-PDF), verify the printer drivers are updated. 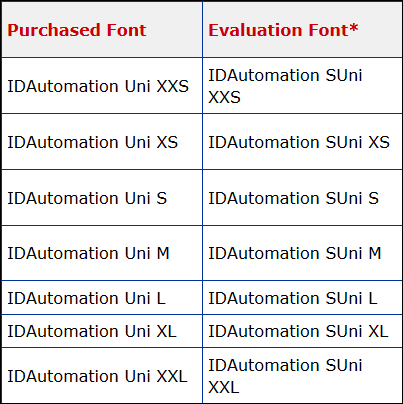 danigome	 I have selected "IDAutomation Uni L" font in Oracle Reports and when I print the barcode I get several characters instead of a barcode. I have installed universal fonts and I can't see the barcode. 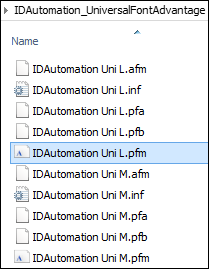 Ben When using an IDAutomation Universal function, the IDAutomation Universal Font such as IDAutomation Uni L (or demo version IDAutomation SUni L) must be applied to the encoded data. The barcode is generated but is huge (half of page). I'm using barcode font IDAUTOMATIONC128M.